Why keep switching between Slack and your traditional CMS to publish content when you can push your Slack posts directly to the mobile devices of your target group? We all love Slack. Lots of editors, content and communication people do. It is a favorite tool in newsrooms (see what digiday.com wrote back then), where it improves workflows and transparency. Editors can get alerts, analytics or KPIs as well as new posts and news directly to dedicated channels where they can then be discussed. Slack Integrations are key to making that all happen, but in most newsrooms and use cases this works only “inbound”. Meaning: data and content is imported into Slack, while editing and publishing content to the various distribution channels still happens in a traditional content management systems. In many cases, these are two completely separate worlds; window and system. But the power of Slack is not just to receive and display valuable information, but to improve productivity by triggering immediate actions. The mobile content game is about delivering news on the spot, about spoon feeding, about up-to-date news feeds, and a user that expects something new whenever he opens a website or app. Publishers, brands and enterprises have to support a growing number of platforms and channels with mobile being the key platform in most cases. They have to be fast. And they need to be able manage a lot of incoming information on the go. So why not enable small teams to directly curate and also publish content — whether it is news, service information or help content — from Slack to their mobile target group?! 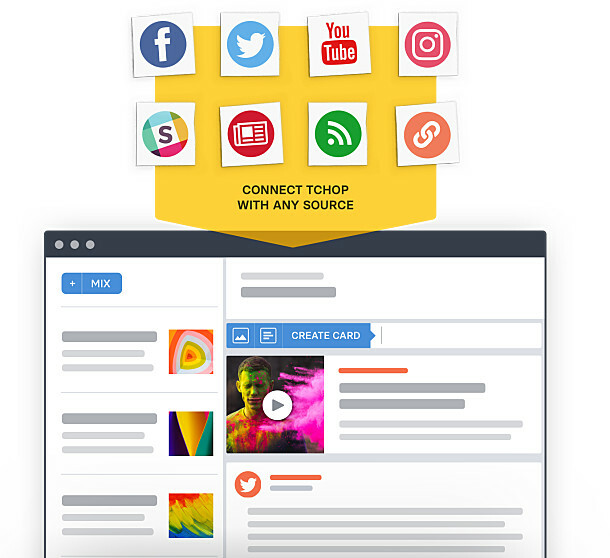 More than two years ago, we started tchop as a new kind of content curation platform with the focus on mobile distribution. Our framework covers an easy-to-use, browser-based editorial interface that can integrate feeds from other sources and that also offers ready-to-go native apps, that you can customize, brand and build on top of. Just like Slack we’ve built our platform around the idea of “integration” (https://tchop.io/en/integration) based on a transparent Input API, that let’s you easily hook up other tools and feeds. 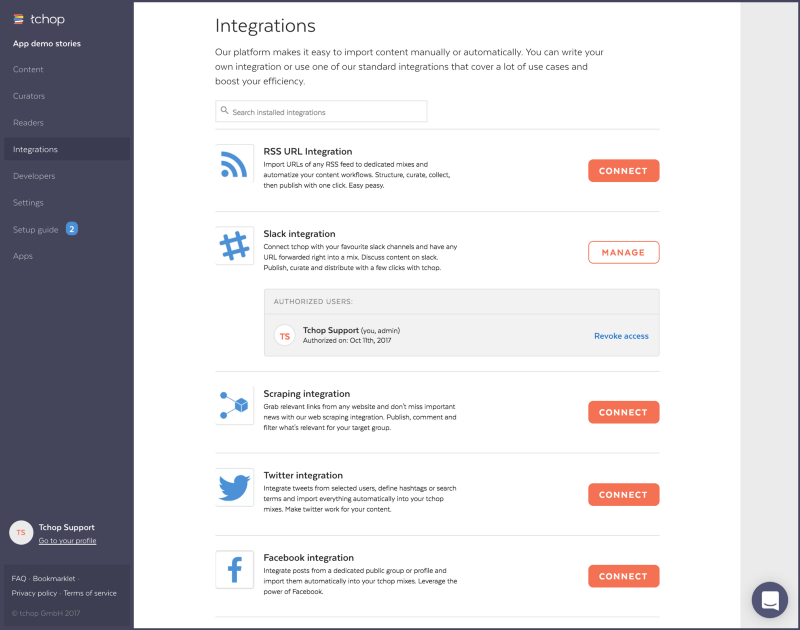 We have standard integrations for RSS, to scrape news from any website, for Twitter and Facebook and we’re constantly working on more and more platforms to connect with. We don’t want to be another CMS. We see ourselves as a clever and intuitive, thin top layer covering and pulling together all the digital contents out there. We feature a flexible structure of channels, mixes and cards to display content and create context (learn more about our principle here). Slack has a very similar approach and structure based on channels. Apart from different naming they work absolutely similar. With our Slack integration you can connect a dedicated channel on Slack with any mix on tchop. So every article, tweet, Facebook or Instagram post and any images or GIFs that you post to that Slack channel will be pushed to the corresponding mix on tchop. You can decide if you want to publish immediately or if you want to continue to work with the content on tchop. Slack becomes a smart and highly efficient backbone for your native news app — especially if you want to curate and publish content to your management teams, your employees, and your sales department and of course, your customers, clients and stakeholders. Since you are free to choose and sort channels and mixes on both sides, you can prepare the perfect set up for your needs. Of course you can edit the integration and change options at any time. You can also connect several Slack teams or channels to one mix on tchop. Given the flexibility of Slack, that provides a big set of opportunities. Curate interesting news in your Slack team channels and autopublish them to selected tchop mixes — you can feed 24/7 premium mobile news apps literally without leaving Slack at all! Source everything that is discussed and curated in a dedicated Slackteam/channel and push it to tchop so that a chief editor/admin can finalize selected pieces from there with just a few clicks. Use tchop as an internal, auto-generated, read-later tool to follow up on what was posted and discussed on Slack. Content in context. The structure of channels, mixes and cards is very powerful. It gives you a lot of flexibility and freedom. While Slack is about conversation, our platform is about content. Both platforms are made for mobile with awesome extensions that let you share, sort and publish any content from your smartphone. Our experience in the last few months shows that this is a pretty good fit, especially for teams with limited resources. Slack offers us much more options for a deeper, smarter integration and we’re always considering various improvements and new features. We want to enable more options to edit and comment links but also to publish longer texts or discussions from Slack directly to tchop. We are also planing to extend the capabilities of our input API to make it more powerful. The best is still to come. Nevertheless we hope that you’re interested and ready to check it out anytime. Feel free to comment or share your views and experiences. Previous Post How to use native sharing smartly..